The question whether this is an extraordinary documentary is moot. It has remarkable access to an extraordinary man and his extraordinary achievement, the Ninth Symphony of rock climbing, something never done before. 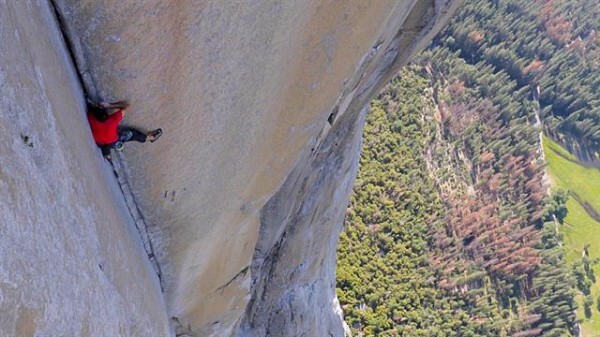 After eight years of thinking about it, and one abandoned attempt, Alex Honnold accomplishes probably the greatest feat in rock climbing history, the scaling free solo, without backup or ropes, of the 7,569′ solid granite vertical rock known as El Capitan, in Yosemite. I didn't intend to write about this film. It's been out for two months; I've wanted to see if all this time and made it today on my fourth attempt. The first time I bypassed it to see Wildlife, because I misread the local schedule and thought Dano's film was leaving after that Thanksgiving afternoon show. The day after Thanksgiving the crowds were out in Berkeley and there was literally not one possible seat in the auditorium where Free Solo was showing. The day after that, I started late and post-Thanksgiving holiday traffic was practically deadlocked. Today, not so much traffic, and surprisingly, not so many to see the film. 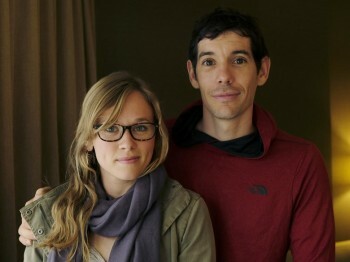 Alex Honnold. His torso is impressive, a wiry network of ropes. He doesn't need to do Pilates to strengthen his "core." The arms and hands are the key to every move in rock climbing, we learn. But what dominates the film is his face. It's the face of a friendly outsider, an alien. He's preternaturally alert, a beyond-elite athlete who has at the same time that calm, slightly dreamy look of elite runners. He looks dreamy, almost asleep, either because one who does super workouts needs an unusual amount of sleep and rising before dawn to catch the side of the cliff before the sun hits it, he's lost some sleep, or it's all those endorphins. The eyes. You see how big they are even in childhood photos, where they pop out like big dark buttons, round and black. The film crew, I read in a New Yorker article, called him "Bambi," because of the big eyes. They give him an innocent look. And there is an openness and sweetness about the face that initially hides the fact that he is emotionally untutored and unavailable. This brings us to the fact that Free Solo isn't just a movie about an athletic accomplishment but goes into surprising depth about its subject's background and relationships and his views of himself and his world. He recently acquired a girlfriend. Apparently he has had many, but this is the keeper. Her name is Sanni McCandless and she met him at a book signing, where she left him her phone humber, he followed up, and the connection stuck. Through Sanni, Alex is learning how to recognize emotions and express them. They exchange a lot of love and affection and spend a lot of time together, which is wholly new in his life. He likes that she's "small," and acknowledges things are a lot better with her, than without. She says she liked him because he was an original, and because he was ruthlessly honest. The latter trait enriches his narration because he holds nothing back, and the filmmakers are all climbers themselves. The narration is chiefly by him, by Sanni, by older ace climber and friend Tommy Caldwell, and sometimes by the filmmakers. His mother, a French teacher, who appears in the film only once, spoke to him and his sister only in French. He says one thing she often said was "Presque ne conte pas," "Almost doesn't count." She taught him to strive for perfection. She would never interfere with his taking extreme risks when it was necessary for what he wanted to achieve. She says that in her one brief appearance. This perfectionism and emotional distance is not so easy for Sanni. Alex's father was supportive but depressive, and almost certainly had Alzheimer's. He died when Alex was nineteen. Alex was a loner and misfit, though fortunately in a liberal school where that didn't mater so much. But he has lived for years in his van. When he cooks himself dinner, he eats it from the pan right off the spatula. Only Sanni leads him to buy a house at last. He tells a class, and this is useful information because we might think him indigent until the house-buying, that his income is equivalent to, say, a moderately successful dentist's. What he does, his "hobby," his dream, happily provides him with a living, he tells the kids. The remarkable and admirable thing about this film is that the extraordinary feat Alex carries out seems almost in some ways an afterthought, for the film. It comes after we have learned all these interesting things about this unique young man. 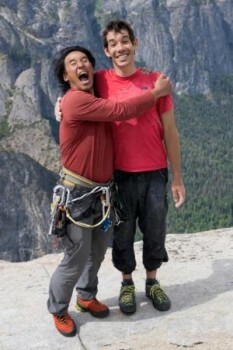 It's also true that the filmmakers are part of the film, and provide a recognized obstacle to the climb of "El Cap." So, it turns out, does Sanni. Not that they can get in his way. Of course we learn a lot about El Cap and other sheer cliffs, including one in Morocco that Alex climbs with ropes, with Tommy Cladwell, which they say is good parctice for El Cap. 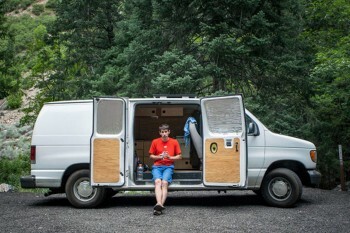 But there seems to be a connection between Alex's being a loner and living almost like an outcast, and rock climbing, and his finding his way to its highest challenges. There is physical ability second to none, no doubt, but there is also a drive for perfection that he acknowledges, and that is more important than any relationship. In the end he has to send Sanni away for a while. We see that and we see her cry afterward. He also, after an abandoned attempt, has to keep the filmmakers at a certain distance from the climb. He can't be in contact with them and talking to them while doing something where every shift of the foot could lead to his death. There is something this film makes you think about but doesn't explicitly examine, the layered meanings of the difference between rock climbing with ropes and free solo, climbing without anything. It's "only" difference is that if you fall, you die. But that makes everything different. Another world entirely. It's something to think about. Levels of the game. You can't make a single mistake. We get to see a particular hard segment of the climb (known as Freerider) and the alternative moves, none of which seems without serious risk. We also see that Alex has gone over every move meticulously in the whole climb. This is why the finale, the actual climb, seen at first from a distance, is both anticlimactic and horrifying. Because we've gotten to know Alex well enough, it has personal meaning when he finishes, at the top, and keeps repeating, "I'm so delighted." He hasn't other words. This is an exceptional sports/athletics/outdoors/adventure documentary and is a must-see for any fans of such exploits as this. Free Solo, 100 mins., debuted at Telluride Aug. 2018, also played at nine festivals, including Toronto, Mill Valley, Amsterdam and IDFA in Groningen. Its US limited release began 28 Sept. Screened for this review at Shattuck Berkeley 25 Nov. 2018. Meatscore 82. Last edited by Chris Knipp; 11-27-2018 at 05:56 PM. It's going to play for one week in various locations in iMax. Certainly a good idea - the experience will be more spectacular than ever. I am in agreement with most of what Chris has described. But his commentary about the movie is more about the amazing man and his singular story itself and less about the movie. I enjoyed the movie immensely and yet perhaps I am more focused on the movie experience itself as a drama rather then as a documentary which it is. It's likely I am comparing apples to oranges when I say this, but the more emotively impactful mountain climbing movie experience for me was Touching The Void (2003) the vivid and emotionally riveting re-creation of an historic near mountain climbing tragedy.